For the first time Mass Maharaja Raviteja and creative director VI Anand coming with crazy project. Ram Talluri is bankrolling this prestigious project under the SRT Entertainments banner. 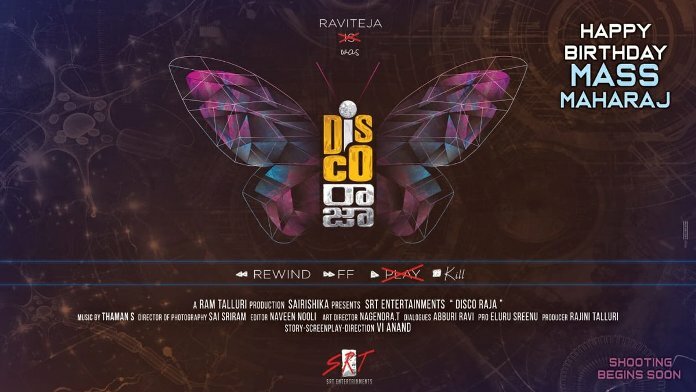 The title “DiscoRaja” has been finalised and title logo was launched today celebrating Republic Day as well as the birthday of Mass Maharaja Raviteja. Producer Ram Talluri said “ First of all, on behalf of STR Entertainments banner we wish Mass Maharaj Raviteja a happy birthday and happy republic day to all movie lovers. We are very excited to work with Raviteja for one more time. SRT Entertainments always stands tall in bringing new age stories to entertain Telugu audience. Director VI Anand narrated an exceptional story, and we have decided to kick start this project as soon as possible.. This is a movie with different and intresting concept and we will produce this movie without compromising on budget issues. We are planning to shoot the movie in Hyderabad, Goa, Chennai, Ladakh, Manali, North India and some places in Southern India. We have finalised “DiscoRaja” title to this project. Top technicians in the industry along with VI Anand will work for this crazy project. Thaman SS will compose the music, Sai Sriram will be the Cinematographer. Abduri Ravi is penning the dialogues for this movie. Three heroines will be romancing with Raviteja and Bobby Sinha will play the antagonist in the film. Vennela Kishore, Sathya, and other actors will feature in the project. Now we are under pre-production works and we are going to start the first shoot schedule very soon. Rav Teja, Payal Rajput, Bobby Sinha, Sunil, Vennela Kishore, Sathya, Annapurnamma, and others. Copyright © 2010 andhraboxoffice.com. All rights reserved.